If you want to track your iPhone location and its movement on maps, you can track it by using iPhone tracker. IPhone tracker is a free application which can tell you about the location and movement of your iOS device. This application works by passing through locally stored iPhone backup files and placing stored location data on a map. That means when you use iPhone tracker application, it will show you the locations which are stored in backup files. It is possible that locations are not as accurate but it will show you the nearest places. If you do not want to use this application on your phone, you have to encrypt your iPhone backup files. 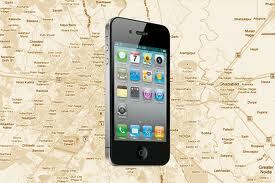 It will prevent iPhone tracker application to track your location and movements. When you encrypt backup file and location data, it becomes unreadable unless the backup is decrypted again. This application has some other features as well like it can create movie of your iPhone movement from one place to another. You can use this application on Mac OS X as well, and windows and Linux versions are going to be release very soon.